The Goliath beetle, above, is the heaviest beetle. Body length for males is 50 - 110 mm, and females are 50 - 80 mm. Above you can see the characteristic black and white or cream markings of the adult. The males have a relatively small Y-shaped horn which they use to fend off other males when they are competing for females to mate with. In the wild they are found in the tropical forests of Africa. Despite its huge size this beetle is a frequent and strong flier. Adults live on tree sap and fruit. In captivity adults can live for a year. Soon after it emerges as an adult the beetle searches for a mate. The female lays her eggs, which measure 4 x 2 mm, singly underground. The eggs hatch in around 2 weeks. Larvae live in the soil, and in captivity they are often reared on cat or dog food. When young the larvae can have cannibalistic tendencies. In good conditions they are fully grown and ready to pupate in around four months. A fully grown larva can reach 130 mm long and weigh 100 g. Pupation takes place in the soil. In the wild they usually pupate during the dry season, and emerge as an adult as the rains start. Above and below are a preserved specimens of an adult male elephant beetle, also known as the Rhinoceros beetle and the Siamese rhinoceros beetle. They are found in South-East Asia and Northern Australia, but now can be found in captivity worldwide as they make popular pets. The adult length is very variable 35 - 70 mm, and as is common with these large-horned beetles the female is much smaller All are black or dark brown and very shiny. Only the male has the two-pronged horn on his head. He uses it to knock other males out of the way when he smells a female. When disturbed adults can make a sound that has been described as a hiss or a squeak. This is made by rubbing the abdomen against the elytra (wing cases). After mating the female lays around 50 white eggs in decaying vegetation. These eggs hatch after around three weeks. The larvae eat decaying vegetation, and can take two years to grow to full size. The beetle pupates in a hole in the soil that it lines with faces which hardens to form a waterproof shell. Pupation takes around a month. Adults are nocturnal, and live for 2 - 4 months. As you can see from the photograph above they have fully functioning wings and they do fly. In Northern Thailand beetle fighting is a popular pastime, with bets being placed on the outcome. It is said that an adult beetle can lift 850 times its own weight. The Hercules beetle, Dynastes hercules, above, is one of the longest beetles in the world. It is one of the beetles commonly known as the Rhinoceros beetles. It is found in the South and Central American jungles where it forages on decaying fruit and plant material in the littler on the forest floor. Only the males have the enormous horns which can make up more than 50% of their entire body length. Adult males can be 170 mm long and weigh up to 85 g. The horns are used in fending off rival males. The beetle gets the name Hercules as an adult male can lift 850 times his own body weight. Although the females do not have the enormous horns, they do actually have larger bodies than the males. The larva lives inside and eats rotting wood. The larval stage lasts around 2 years, and a fully grown larva can weigh up to 120 g. Fallen trees and rotting stumps are the main larval habitats. 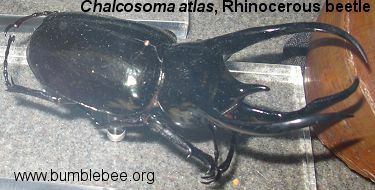 Above is an adult male Chalcosoma atlas, a Rhinoceros beetle. Adult males are 60 - 130 mm long, and females 25 - 60 mm long. As with all Rhinoceros beetles the male uses his horns to fight off rivals for the female he hopes to mate with. They are native to Southern Asia, especially Malaysia. Although these beetles are popular as pets they can be aggressive if disturbed, both larvae and adults will bite. The larvae eat rotting wood, and eat their way through stumps and fallen trunks. The adults eat fallen fruits. Hercules beetle numbers have greatly decreased due to deforestation and pollution. Their main predators are bats, rats, birds and small mammals.